Francois Truffaut was one of the architects of the French New Wave, a former film critic who turned to filmmaking himself. Perhaps best known for such arthouse staples as THE 400 BLOWS and JULES AND JIM, he also had a soft spot for Alfred Hitchcock and pulpy crime tales. 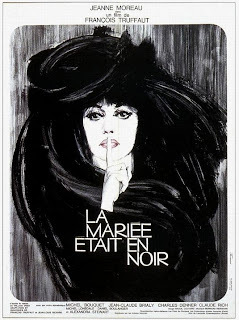 It was in the spirit of the latter that Truffaut made THE BRIDE WORE BLACK, the story of a woman (Jeanne Moreau) tracking down and killing the five men complicit in the killing of her husband on her wedding day. Based on a story by Cornell Woolrich (who wrote the novel Hitchcock based REAR WINDON on, among many others), it's pretty much the archetypal revenge tale. A protagonist who has lost everything sets out looking to get an eye for an eye, and while various logistical and moral complications arise during that quest, ultimately nothing will get in their way. That's about all there is to it, and while it might seem a premise more suited for drive-in or grindhouse fodder, it's always interesting to see what a more "serious" filmmaker can do with such material. Critics of the time hated THE BRIDE WORE BLACK. 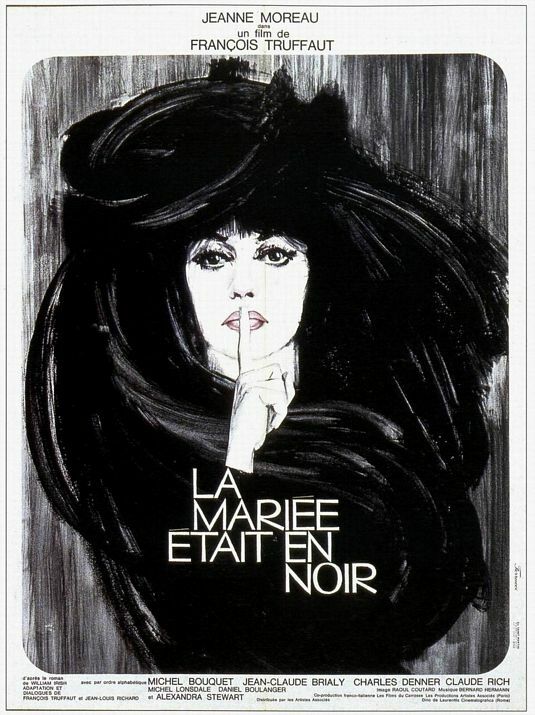 Truffaut himself later said they were right, and that this was the one film of his he'd most like to go back and change. Frankly it's not hard to see why – tonally the film is always a little bit off, with more than a few awkward acting moments, a muddled visual style, and Bernard Herrmann's insistent score adding a further level of unintended camp to the proceedings while simultaneously raising the specter of Hitchcock and inviting comparisons in which BRIDE could only come up short. But even if THE BRIDE WORE BLACK is no masterpiece, it's still a solidly entertaining movie that managed to influence countless other revenge films in its wake. 3 out of 4 stars.